New! Ogunquit Beach town Rental- Close to town! OFF SEASON: Enjoy Maine in Mid May through early JUNE, Late September to early October! the 9% Maine State Lodging Tax, and other applicable fees. Get the best of both worlds. 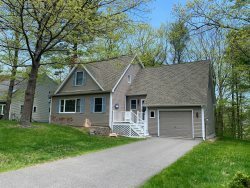 Located in a quiet wooded area yet only a short walk to town and the beach. This property has an abundance of charm! A lucky find! This 2 bedroom, 1 bath home is beautifully and brightly decorated. Relax on the large patio deck. Dine in. Dine outside on the deck. Your choice. Take in this fun community with its amazing Beach, restaurants and entertainment. Visit our beloved Ogunquit Art museum. Take in a show at the Ogunquit Playhouse. Or go and visit our huge state - day trips returning to these comfortable surroundings. The property is available through our beautiful fall until October 31st. 2018 - Lower level offers washer and dryer. 2019 the owner plans on an additional full bath off the 2nd bedroom, and bringing the washer/dryer upstairs as well. ***BRING your own linens, towels, special pillow you prefer. Pillows, blankets, quilts and provided. Cleaning supplies can be found in the kitchen. Lightbulbs - in the living room.